Have you wondered why our ancestors stored water in a copper vessel and drank from it? It is believed by alternate therapists that storing water in a copper vessel kills harmful bacteria and viruses that are present in the water. This ancient practice was followed even when bacteria was unknown to science! Today, researchers are saying that while bacteria can survive for a longer period in water kept in stainless steel vessels, they get destroyed in a few hours when water is stored at room temperature in a copper vessel. 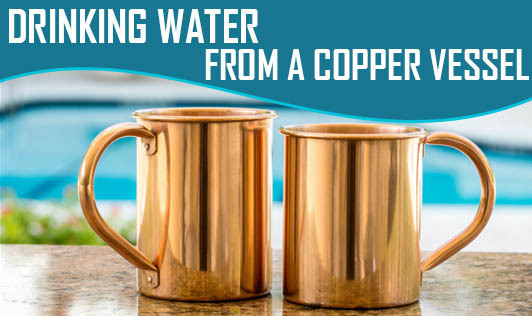 If you wish to use a copper vessel for drinking water, store the water for a minimum of 8 hours and then drink it. It is said that this water should be taken at room temperature and not otherwise. The vessel needs to be washed regularly and kept clean. Srubbing with tamarind is a great way of cleaning a copper vessel, and it's eco-friendly too! Do write to us if you have more information on ancient practices.